Edgar Allan Poe was born in Boston, Massachusetts on January 19, 1809. His creativity and unique style inspired the beginning of unique literary genres, including horror and detective fiction. Poe has been dubbed 'Father of the Detective Story' and credited as the 'architect' of the modern short story. He is one of the first American writers to become a major figure in world literature. The Raven is probably Edgar Allan Poe's most famous work. It is a narrative poem first published in January 1845 and noted for its musicality, artistic language, and supernatural mood. 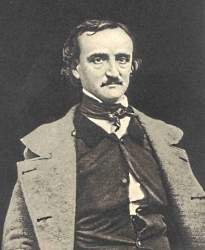 Although, The Raven did not bring Poe much financial success, it made him widely popular in his lifetime. Today, due to both its critical and popular success, it remains one of the most famous poems ever written. 'Though thy crest be shorn and shaven, thou,' I said, 'art sure no craven. 'Prophet!' said I, 'thing of evil! - prophet still, if bird or devil! 'Get thee back into the tempest and the Night's Plutonian shore!